KHS send its students off with the traditional Quiz in the Upper School and the Panto in the Lower School. A special thank you to Sarmad from 8S for creating the fantastic crocodile head! All the photos from the show can be viewed on our blog. This year’s debate was organised by the Upper School Debating Society and the motion was: This House wishes it could be Christmas everyday. A wonderfully lively debate witnessed by staff and students alike debate the implications of it being Christmas everyday. Mr Waxman opened the debate with his customary enthusiasm and vigour, arguing that Christmas was very much about giving to others, and helping. Ms Hunter raised the very many impracticalities this would bring about, and how eventually it could become a little meaningless. Mr Das attempted to sell the health benefits of Christmas, stating this would enable people to get their 5 a day! While Mr Senior implored the masses to ignore the false promises of the proposition, stating that Christmas would be expensive and how it would become a constant stream of unwanted guests. After several tense but well humoured exchanges the opposition dubbed ‘grinches and scrooges’ by the effervescent Ms Williams saw their valiants efforts fall short as the wit and style of the proposition was rewarded with a resounding victory, but not before Ms Regan asked with a wry smile if indeed this was such a good idea why the school had not made it a policy! Thank you to all the staff for giving up their lunch to debate. Debating in Upper School continues in the New Year. Year 10 and 11 will be back on Tuesday 15th January at lunch in Room 55, while the Sixth Form will be back on Wednesday 16th January at lunch in Room 88. We had a range of performances from the department ensembles including a choir of over 40 students led by Miss Kvaerndrup and two different guitar groups led by our guitar teacher Mr Slatter. Students have been working hard putting together and rehearsing their own bands. Pieces performed include Love Yourself, Believer and Seven Nation Army. The concert finished with a performance of Mambo Groove, one of the pieces from last years 7Up project. 56 students took part in this performance, filling the stage. Students attended an employability workshop run by top City firm EY. EY managers and employees presented career options, interview tips and managing your own brand to help students consider not only what career to choose but how to get through an interview. Thank you to EY and to Aston University who organised the event. Only a limited number of schools got to take part and KHS Sixth Form took 25% of all the places as we have close links to Aston University and we asked for more than double the places. Those who attended all had excellent attendance to lessons and attitude to learning scores of either ‘Excellent’ or at least ‘Good’ because it is important students are on track to get the grades required to enter top careers and attendance and work ethic are key to achieving the grades. Think about your strengths. Write down 5 strengths that you can show your interviewers. They could be what you use and do often. Performance, what you do well in. Energy, what makes you feel good. Interviewers and employers only take 20 seconds to read your application or CV, so the first impression you give to them is important. Within 30 seconds in seeing you, interviewers can make first impressions. So: be on time, be prepared and be engaged. Create a lasting impression: show your personality, show that you’ve done you’re research by knowing about why you want this placement, think about your body language, listen, don’t rush and don’t be afraid to ask questions. Think about your presence online. On Tuesday 4th December Kingsbury High School hosted the annual Senior Citizens Christmas Party which was organised and run by our Year 13 Level 3 Sports Leaders. Approximately 70 visitors attended the event from various elderly care homes, church groups and charity organisations from the local area. The entertainment included boccia, carol singing, bingo and a quiz. There was also an opportunity for all to help crochet a blanket which will be donated to Battersea Dogs & Cats Home. Thank you to Valerie Pope, Jenny Cox & Anne Hantouli who helped to run activities on the day. A huge thank you also to our amazing students who not only organised the party, but have also been volunteering their time to help organise activities for the elderly preceding this event. 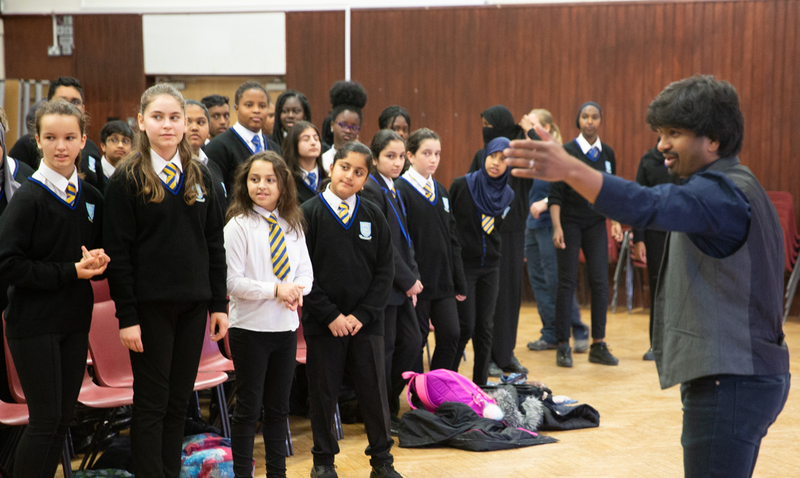 67 students from the Years 7-10 took part in a special singing workshop with Nav Arles and Miss Kvaerndrup. Both are excellent singing teachers and choir leaders and inspired our students with a very productive three hour workshop. Miss Kvaerndrup teaches singing at KHS and leads our school choir. The students worked on two pieces which will be performed at the Winter Concert on Thursday 13th December.